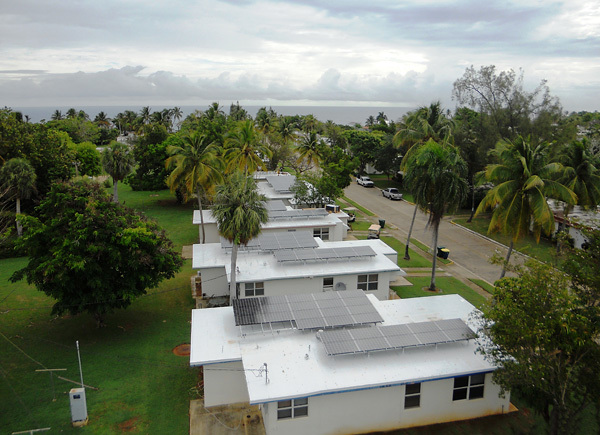 The picture below is how it looks like for the US Coast Guard rooftop solar arrays in Puerto Rico. They are among 2.89MW of solar, still to be completed, made possible by innovative financing. Need one for your home? We too, have an innovative financing on feed-in tariff, FIT, for solar PV installations on our rooftops that works on the principle of forced-purchase by the utility companies for all energy produced and that will go on for 21 years. Good retirement plan if you like. Downside is, everyone (big domestic and industrial energy consumer) will be the ones financing this FIT even if you don't necessarily get to install one on your rooftop. Never mind, being the big spender that you are, you'd probably won't need it, so, just give that quota to the needy. The $50million project is undertaken by Schneider Electric for installation of 2.89 megawatts (MW) of photovoltaic panels on renovated Coast Guard rooftops over a 13-month period. The company is constructing 300 solar PV systems on the facilities resulting in guaranteed production of more than 4,000,000 kWH-hours per year. The photovoltaic electricity production, combined with new cool roofs that will reduce the annual cooling load of the buildings by 3.9 billion BTU, will result in an overall reduction of utility-purchased electricity by an estimated 40%. Renewable energy solutions in Puerto Rico helps the Coast Guard meet federal mandates, reduces green house gas emissions, stabilises energy costs, and helps create green collar jobs in Puerto Rico. This project will have a significant impact on the industry there as there will be spin off business activities along with the solar jobs. It is good to see more institutions heading towards solar power. Here's hoping that it continues to become more widespread.